Lilou wasn't immediately available to snort and oink for an interview, but of course, she has an Instagram page, where she touted her new gig. This pig can't fly but she can greet people who are about to fly. San Francisco International Airport introduced “Lilou” the therapy pig this week as the newest member of the airport’s Wag Brigade. 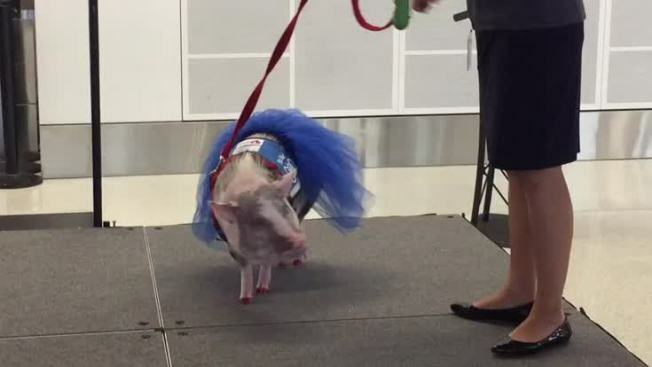 And, not surprisingly, she's the first airport therapy pig in the United States, airport spokesman Doug Yakel said, adding that he's sure she'll be a "big hit" with travelers. Lilou happily let passengers pet her pink snout and her back (all the while wearing a pilot’s cap and a blue tutu) while walking through the busy terminals. At one point on Monday, Lilou did circles and ate treats to entertain the crowds. Lilou wasn't immediately available to snort and oink for an interview, but of course, she has an Instagram page, where she touted her new gig: "City pig & the 1st pig in SF SPCA AAT program." One traveler tweeted that she was more excited to meet Lilou than any celebrity. SFO launched the Wag Brigade in 2013 and Lilou is the first pig to join the ranks of friendly dogs, named Bailey and Biggie, to make “passenger travel more enjoyable.” The dogs — and now, one pig — are trained through the San Francisco Society for the Prevention of Cruelty to Animals and certified through their Animal Assisted Therapy Program. SFSPCA spokeswoman Krista Maloney said the idea for the pig came straight from the swine's owner, Tatyana Danilova. "She was very interested in having Lilou become certified as a therapy animal," Maloney said. So except for the "sit" and "down" commands, Lilou jumped through the same training hoops that dogs do, and passed with flying colors, Maloney said. "She's friendly and she's pretty well trained," Maloney said, adding that Lilou also visits hospitals and senior homes to give comfort there as well. "She's also housebroken, which is pretty important in an airport."